Astro luminaires chosen for the renovation of a 1960's bungalow in West Wittering. 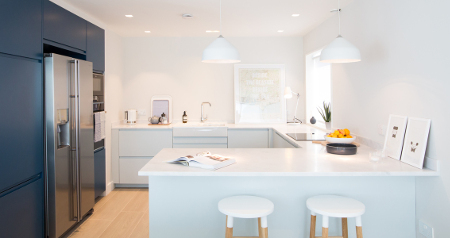 Architect Leigh Bowen and wife Charlotte Bowen worked with Lighting Designer Richard Fallows to specify a number of Astro luminaires for the renovation of their 1960's bungalow in West Wittering. The designs chosen included Ginestra pendants to illuminate the dining space and kitchen worktop, as well as an Atelier desk lamp in a clean white finish placed in the kitchen for additional task illumination. 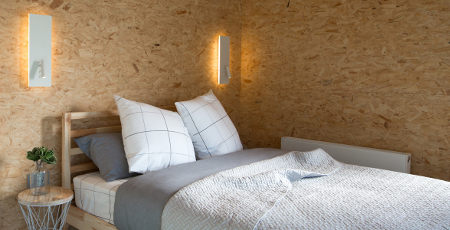 In the bedroom, Edge Reader wall luminaires add interest against the Oriented Strand Board walls, offering both ambient and task lighting in one lighting design. “Astro offers high quality lights with longevity, adding real gloss to the surrounding architecture” – Leigh Bowen.